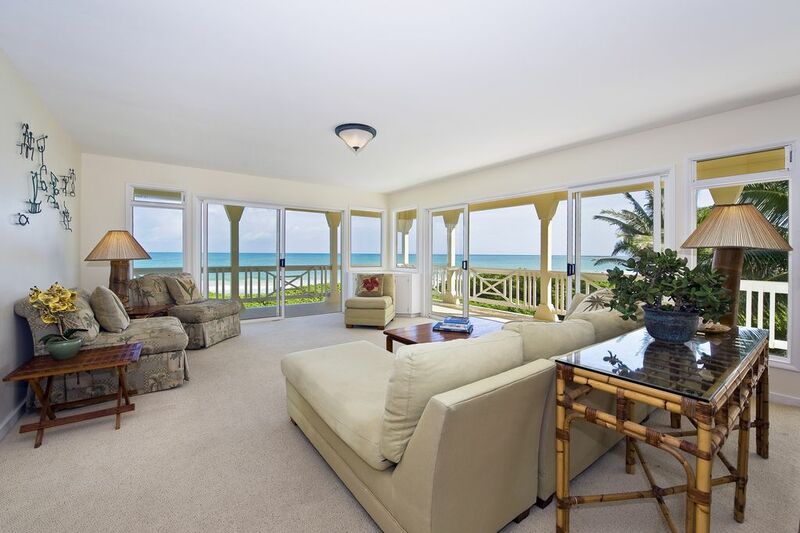 Our BEACHFRONT home is designed to provide you with a perfect vacation retreat. You will be as close to the beach as a house can be built. The beach of Kailua is renown for its fine white sand, blue green waters and safety. This is not a crowded beach, but has a pleasant neighborhood feel. The 4 Bed/3.5 Bath house gives plenty of space. Upstairs/downstairs and corner bedrooms offer privacy when needed yet togetherness as desired. The 1300 sq ft wrap around lanai gives everyone the feeling of participating in the adventures, whether watching and yelling encouragement, or showing off newly learned water skills. Our house has everything you need and a casual feeling that will make you feel right at home. The Hawaiian style furnishing and feeling has made our home recommended by some true Hawaiian leader as the best Hawaiian home available. A garage FULL of BEACH TOYS, YARD TOYS, BBQ OPTIONS, TEAK LOUNGERS, ROCKERS, & TABLES will ensure that you never have a dull moment. The Large Yard allows for plenty of play as well as relaxation. Kailua is a charming town that has many delicious restaurants and shopping for everyone. You can get all the essentials and find many things to take home as moments of you Hawaiian vacation. Getting to attractions such a PEARL HARBOR, the NORTH SHORE, HANAUMA BAY is very simple. The House : The house has 3 Bedrooms Upstairs and 1 in the Lower Level. The Upper Master Suite has a king bed, full bathroom, and private access to the lanai. 2 Koa Wood Twin Beds furnish the Koa Bedroom which has great views of the beach and yard. A Large Living Room opens onto the Lanai overlooking the ocean and wrapping around three sides of the house providing views of the beach, the yard, and the mountains. Comfortable couches allow for maximum relaxation while taking in the views of watching a DVD on the flat screen tv. The dining table is perfect for gathering around for dinner conversation. Downstairs consists of a semi Private Suite with King Bed and Private Half Bathroom. The Lower Living area features a galley style service kitchen which opens up to a dining area, sitting room, and full bath. The Property : The entire home was designed to be a true representation of Hawaii. The Plantation style architecture celebrates Hawaii’s heritage of sugar and pineapple plantations; workers and land owners on the plantations would live in homes stylistically similar to ours. The interior décor of our home reflects this tradition as well while providing modern convenience and comfort. Our furnishings are made of woods and materials traditionally found on the islands, Koa and Bamboo, and we strive to keep the feel of Hawaii throughout the house with tastefully chosen accessories. Extras: EVERYTHING for your beach vacation is provided with the house- towels, chairs, bbq grill, loads of Beach Boys, and an outdoor shower with hot and cold running water. Check-in/check-out times...we try to be as flexible as possible. We state in our booking contract that the departure time is 10:00 am and arrival time is after 2:00 pm. For same day changeovers, this gives our management team four hours to clean the house thoroughly and change the laundry. However, we often have a day or more free between bookings and in this case, if a guest has a later flight or arrives early, we are more than happy to accommodate late departures and early arrivals at no additional cost. We strive to make our home reflect all that is beautiful and pleasant about Hawaii. We want our guests to have a easy and memorable vacation. We think the magic of visiting Kailua on the Windward side of Oahu is the best possible choice for a holiday. Live in a home that arguably has the best location and views in Hawaii. The drive over the Pali Highway or H-3 is magical. The charm and comforts of Kailua town. There are many colorful shops but yet all the amenities of a big town. The restaurants are delicious, and you can enjoy different cuisine every night and not choose a favorite. Need we mention the amazing beach literally at your front door. Kailua Beach is ranked as one of the nations premier beaches and it is Hawaii's safest. It's 3 miles of pristine white sands and blue waters are best viewed from our home. Possibly the best beach access, the best beach, the best accessorized home, in the best town in Hawaii. We offer A Taste Of Hawaii----Last summer we hosted a family who was recommended to our home by a 'Hawaiian Kahuna' friend because 'this is the house that best represents what he wanted his vacationing mainland friends to experience in Hawaii'. toilet, Directly Attached to the Downstairs Master Bathroom. 42 feet from the Pacific Ocean across lawn & easy access. An ideal location. You can watch beach activities from your lanai chair and feel like you are on the surf or boogie boarding with the kids. Kailua Town is really a small beach town with world class restaurants, shopping, and activities. 2 Farmers Markets within a short walk of home. Whole Foods is the nearest of 5 supermarkets. We are directly on the beach. Yard has 100+ ft of beachfront. Soft grass to a pure sand beach is just 50 ft from the house. Nowhere is there better beach access. All beach accessories supplied. How about a SURF-IN and SURF-OUT. Surfers, kayaks, swimmers, boogie boarders, stand-up-paddlers, Kite/Wind Surfers, beach walkers & sun bathers right in front of the house & all along the beach. -Fine Quality linens on all beds. -Ample and plush Hotel Quality white bath towels, hand towels, and wash cloths. -Man large beach towels for beaching. -Backup mattress pads, sheet sets, and blankets for each bed. Two LG front loading washing machines with plenty of Laundry Soap and Supplies. Two car garage and off street parking for many more. 2 car garage with ample storage. 6 surf boards, 6 boogie boards, a dozen sets of snorkel gear, kites, wind surfer, 4 bicycles, beach toys, and more. For kids of all ages. Fiber Optic Internet Connection. Eero Net Internet System throughout house and yard. Several dozen Macy's Hotel Series towels, hand towels, and wash cloths. A dozen or more beach towels in a cabinet by beach access door. 42 foot to beach, swimming, boogie boarding, jogging, SUP boarding, kayaking, beach walking, surfing, and more. All needed equipment on site. Wireless Eero Net server and wireless printer. Upstairs carpeted, formal living room with sectional couch, chaise lounger, TV, and excellent art and furnishings. Downstairs carpeted less formal with antique Hawaiian rattan furnishings. Great art. Two Full frigerators. Upstairs kitchen has built in GE french door refrigerator with bottom freezer and ice maker. Lower kitchen has stainless steel, full size fridge, bottom freezer, and ice maker. Full size glass top range with oven. Toaster in each kitchen. 4 slice toaster and bagel toaster. Inside dining upstairs for 8 to 10. Downstairs inside dining for 4 to 6. Teak outside table for 6 to 8 on lanai. Lawn teak dining set for 4 to 6. Another teak table for yard with chairs. 42 inchFlat screen in upper living room and in master bedroom downstairs. Premium cable channels. Much Hawaiian history. Eclectic WWII books, miscellaneous popular novels, hiking, driving, and Information about Hawaii. Board games, puzzles, croquet set, Bill-a-Bong game, paddles boards, cards. To many to describe. From 1 to 100. 10,000 Sq Ft of Golf Course quality lawn. 6 Coconut trees with fresh coconuts. Teak garden swing for beautiful and romantic evenings. Lawn path to ocean. More stuff than you can use. 6 ocean kayaks. Two are new double kayaks, and 4 single kayaks. Fully equipped with paddles, leashes, seats, life vests. All just a few feet from the Ocean. 4 miscellaneous bikes. From Trek to Schwinn. Not pretty or fancy, just basic bikes that have been exposed to salt enough to be not pretty. They work well, we keep them up but they are not fancy. Lanai/Deck/Gazebo/Patio/Lawn/Beach..It all runs together . 2 Teak tables, each chairs for 6 or more. 4 teak rocking chairs, 5 teak steamer loungers, teak side tables. Multiple sun umbrellas. Lanai/Deck/Gazebo/Patio/Lawn/Beach..It all runs together. 4 teak Steamer Recliners, Teak dining table with teak chairs, beach chairs & side tables. Outside hot/cold shower. Teak double porch swing. 4 to 6 Surf Boards, 2 SUP boards, lots of snorkel equipment, 6 or so Boogie Boards, Skim Board, and more. Tennis racket and balls. Volleyball net. Hawaii is one big golf course. 3 or 4 courses within a mile or two. Two sets of questionable golf clubs. Went for 7 nights in late March '19 from the east coast US. This is an EXCELLENT home for a big family vacation. 2 separate living areas are very helpful for times when sleeping children or whoever need some space. Wait until you see the view from the upstairs living area. Took our breath away when seeing the electric blue-green water and 180 deg view of the bay and Mokes for the first time (and each time after). It really is a spectacular view that never gets old. The home is stocked to the brim with all the items you need on vacation. Just show up with your own clothes, shop for food upon arrival, and everything else is there already. Little things like stacks of to-go coffee cups with lids, paper plates, solo cups, laundry detergent, dryer sheets, coffee filters, etc. are all there waiting for you. There are like 10 sun hats, spare sunglasses and headstraps, sun lotions, dozens and dozens of bath and beach towels, etc. The 3 kits, 3 SUPs, 6 boogie and 2 surf boards, 5 water shoe sets, 6 snorkel mask sets, 6 Kayaks and even 3 or 4 WET SUITS are all right there for your enjoyment. 4 Bikes there as well to ride into town just 4 or 5 blocks away. The owners and this place are impressive in every way. Has a well manicured grass yard around the house which is great for lounging when done with the beach for the day. Outdoor shower (no walls/curtain) also is nice to have for sandy bodies and feet. We will book this home again if we return to Oahu. It is a perfect vacation home. Only reason 4.5 not 5 stars is we weren't told there is home construction taking place directly next door (remember the open windows all the time since no A/C - which is not needed at all FYI). WITH THAT SAID it seemed like a genuine mistake and the owner made amends, was very responsive to the situation, acknowledged fault right away and took care of us. Everything turned out fine/great. Any other minor questions/issues we had were addressed immediately. I would highly recommend this owner, house, location, everything. It is 5 star in every way as long as you don't required marble bathrooms and such. I like a place you can come in a little dirty from playing and feel comfortable - not worried that you are messing it up. We loved it. I don't know how else to word it any better. Thanks Dan and thanks Kailua. We fell in love. Our goal is to make the vacation a vacation from beginning to the end. We try to anticipate what will be needed but forgotten, we encourage everyone to enjoy themselves until the last minute. Any laundry and clean-up is ours, not yours. Thank you for your kind words. Dan and I always enjoy hosting your delightful family. We appreciate that you treat our home as your own. Watching the younger Whites hit the surf of Kailua Bay within minutes of your arrival really made our day! We look forward to your next visit to our home and Kailua Beach. We had an amazing time here. The location is great. Set on a picturesque white sand beach where the kids played and seam for hours and adults took long walks. The waves are perfect for boogie boarding and the house came stocked with every equipment imaginable. When the kids got bored of being on the beach, we walked back to the house and enjoyed the soft grass yard with games, loungers, etc. Daniel and Virginia were wonderful hosts. Aside from giving us plenty of recommendations, they went above and beyond to make sure everything was in working order. We can’t wait to come back next year. This place is really special. Beautiful house! Great views and so well appointed! Everything you can possibly need is there! Hope to return! Thank you for writing such a nice review about our beach front home. You and your delightful family went out of your way to make up for any deficit our home had. Hosting/meeting you and your family are what makes the home exchange fun. What a fantastic location and home. Everything and more you expect when staying in a beach front house. Every detail is considered every amenity is right there for your comfort. The house is meticulously cleaned and maintained. My stay was two people there is absolutely plenty of room for 8 very comfortably, plenty of linens, house towels and beach towels. Washer and dry both very efficient should you need. There's even an electric car charger!! For a fun family trip, plenty of entertaining room, or for a romantic getaway this is the place. The beach is about 30 yards away, enjoy your morning coffee on the lenai rocking in a rocking chair watch the sun rise listening to the waves. This was truly an amazing stay. definitely strongly recommend and encourage you to stay here! I know I will stay again on my next visit! Thank you Dudden Family!! Dan and Virginia's beautiful home in Kailua was perfect in every way for our family vacation. Eight of us (parents and young adults) enjoyed all the amenities that came with house: great kitchen, every water toy you could want (SUPs, surf boards, kayaks, boogie boards, etc), lawn games, bikes, coolers, hats, rash guards, sun screen, sand chairs, beach towels, grill... you name it! We ate most of our meals at the house and enjoyed cooking together in the well-stocked kitchen (all the spices, utensils and dishes we needed) and loved spending time on the beautiful wrap-around porch, perfect lawn and - best of all - the amazing, beautiful and quiet beach just steps from our back door. The 4th of July fireworks right over our beach were an amazing bonus to the wonderful week we spent together. Couldn't have asked for a better location - easy walks or bike rides into town (and shave ice!) - and the gorgeous beach to look at and enjoy 24/7. Dan and Virginia were perfect hosts and were very helpful before and during our stay. A wonderful vacation that our family will never forget! Mahalo! Marilyn and her family were wonderful guests. They are very active and fun people who have fun together as a family. They tried every activity available. Every time I stopped by I was envious of the fun they were having. Things were cleaned and put away when they departed. The house and the furnishing were well treated. Maybe the best ever. I hope they will visit you someday, this is a family that makes hosting fun. Our Beach Front home is in Kailua,Hawaii on the windward side of Oahu Island. Oahu means "The Gathering Place" and Oahu is the center of Hawaii's business activity, & government, contains 80% of Hawaii's population, and includes Honolulu, and Waikiki. Our home in Kailua is 15 miles across the island from this activity, yet is only about 30 minutes from the airport and all the world class activities, entertainment, and culture of Honolulu. To and From Honolulu is usually on the PALI HIGHWAY, (or Hwy 61) The Pali Highway, to me, starts on the windward side of Oahu at the stoplight nearest my home then windes 15 miles across the island and through Chinatown, downtown (Central Business District), and ends the Leeward side of Oahu, at Aloha Tower, in Honolulu Harbor. 1) The Pali Lookout: This is where King Kamehameha defeated Oahu's Army during his quest to conquer all the Hawaiian Island. The views are great. 2) Take the Old Pali Road through the jungle and rain forests, It is beautiful and very tropical. 3) Almost in Honolulu, but on the Pali Hwy is Queen Emma's Summer Palace. 4) In Honolulu, visit Iolani Palace, the only Royal Palace in the USA. 5) There is an endless list of excitement and activities in Honolulu. EAST END OF ISLAND Taking a left turn (Opposite Direction) off our street onto Kalaheo Drive there is a shorter drive that takes you around the East end of Oahu. On this road you will pass the Makapuu Lighthouse hiking Trail, a Blow Hole viewing pull off, and snorkeling at Hanauma Bay. Travel on into Hawaii Kai and/or Honolulu. One of the islands more famous hikes is to the beautiful views from the Lanakai Pill Boxes. This is a short and uneventful hike (don't give up on the first 100 yards) you can start from the house by walking towards Lanakai, or if you are tired of beach walking, drive the mile to Lanakai and park across the road from the Mid-Pac Country Club. Heiau's are plentiful on Oahu, from ancient warshiping ruins, royalty birthing temples and more. Our home is on Kailua Beach, just 42 feet across a perfectly manicured lawn to 3 miles of tropical waters and sand Beach. Kailua Town is a charming beach town with many great restaurants and great shopping. There are some particularity good upscale restaurants along with delicious casual dining. The area has many grocery and drug stores and other services to make your stay easy. There are two Farmers Markets each week within a few blocks from home. We are uniquely located in the middle of Kailua Town, Whole Foods is the nearest market. Yes our home is secluded enough that you will not see or hear a car or traffic from the house for the duration of your stay. Access to Kailua town (and to Honolulu) is easy, no more than two corners to turn. There is always beach activities to watch or join. In addition to sunbathing and beach novels there is great boogie boarding, kayaking, windsurfing, kitesurfing, stand up paddling, and other ocean sports to enjoy. Surprisingly enough you will often have the beach to yourself. Kalama Beach Park is a mile in one direction, Kailua Beach Park a mile in the other but it is pure beach to the beach parks and beyond. Kailua is the perfect vacation spot, out of the hustle and bustle of Waikiki but a nice and comfortable community with amenities galore. Kailua Beach is known as a favorite among locals for its incredible beauty and peacefulness. We are just a 30 minute drive from many of the local tourist attractions like Pearl Harbor, but you will feel a world away while enjoying our home. Golf: Some say Hawaii is one big golf course. All courses on Oahu are easily accessible from our home. Terms are very good. 25% at booking, balance due 30 days before arrival. No deposit required. The toys and recreation equipment I provide is worth a sizable portion of the rent. Don't sit on the beach wishing you could surf, snorkel, boogie board. We provide those and much more. We love to cater to extended family vacations and our house and location is very suitable for that. Contact us at 808-262-8282 for additional information.